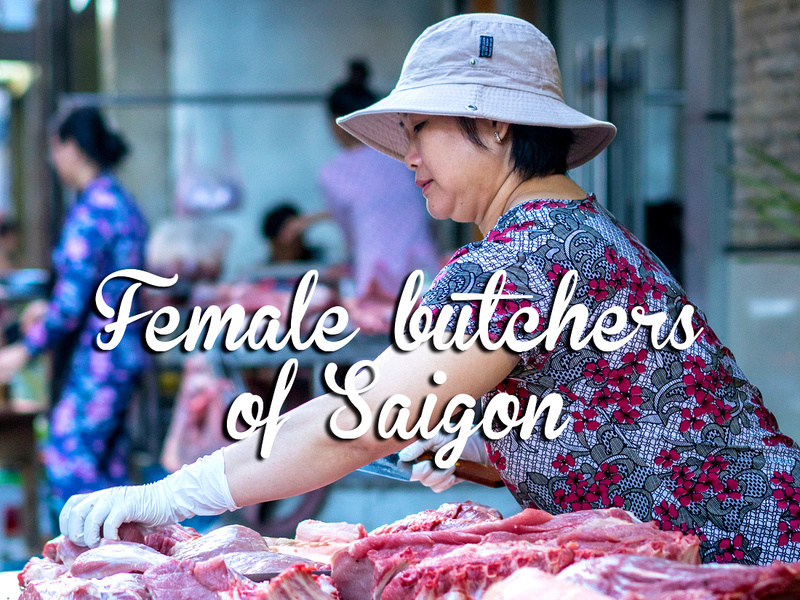 This time last year I would’ve been hard pressed to tell you what it is exactly that fascinates me about the female butchers in Saigon (and throughout Vietnam in general). Up until then, I’d actually never even realized that I had a fascination with them. 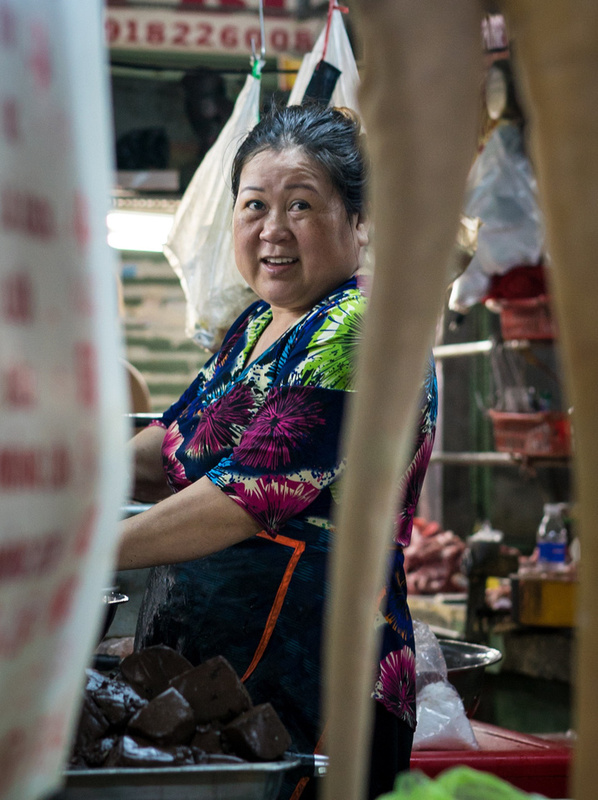 Then one afternoon, as I scoured my extensive library of Saigon images, I realized that I’d unknowingly gravitated towards the female butchers each time I visited a wet market. 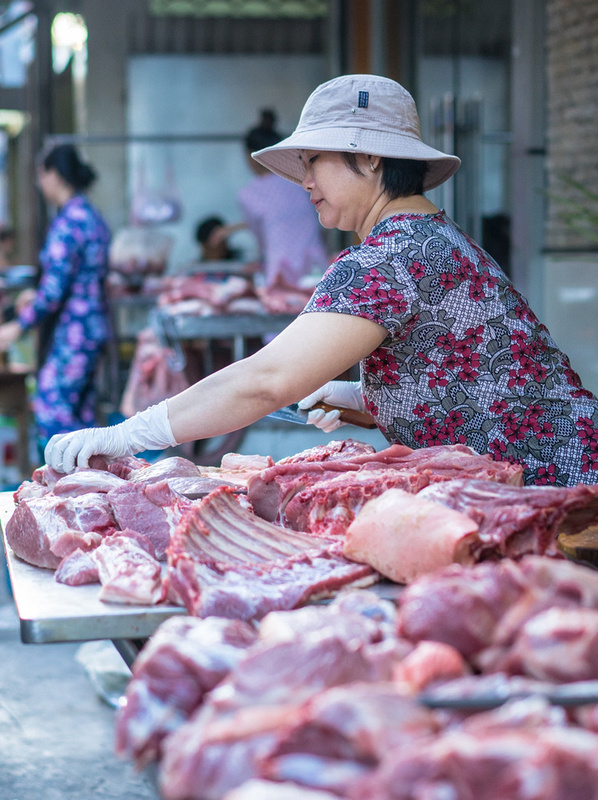 In an age of pre-packaged supermarket meats, I’ve encountered several foreigners, men and women, who cringe at the mere sight of slabs of meat. Yet in Vietnam all parts of the animal are used. Nothing goes to waste. Something a young girl learns early as she accompanies her mother to the market. 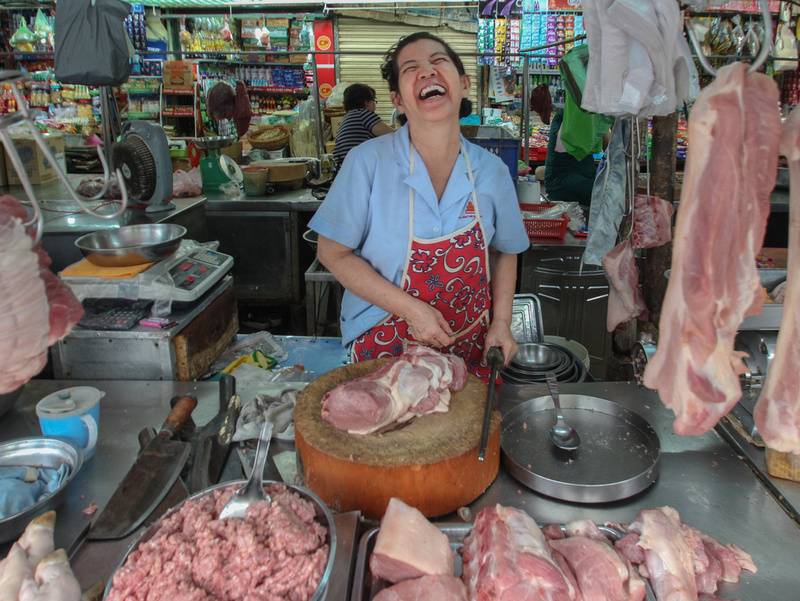 The daily morning banter of the butcher with her customers is always entertaining. 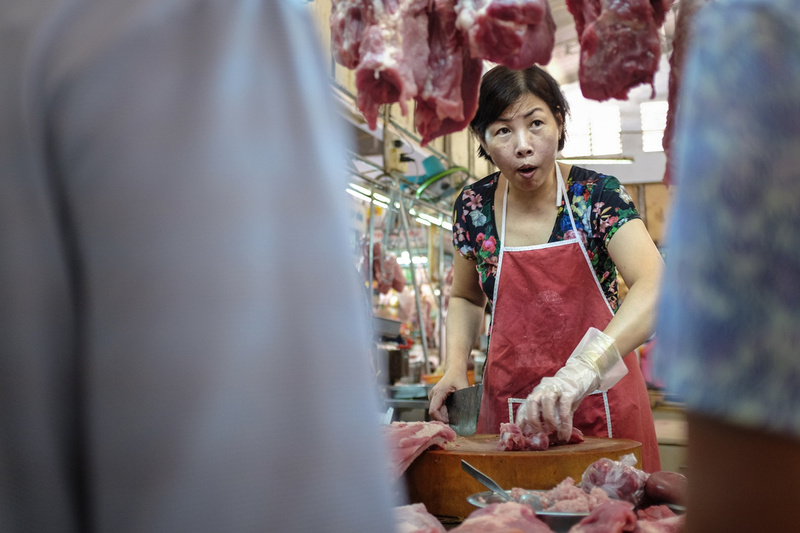 As cuts of meat are scrutinized between thumb and index finger, the female butchers laughs with her client, reassuring her that it’ll do perfectly for her dish. Other times, a little more convincing is required. 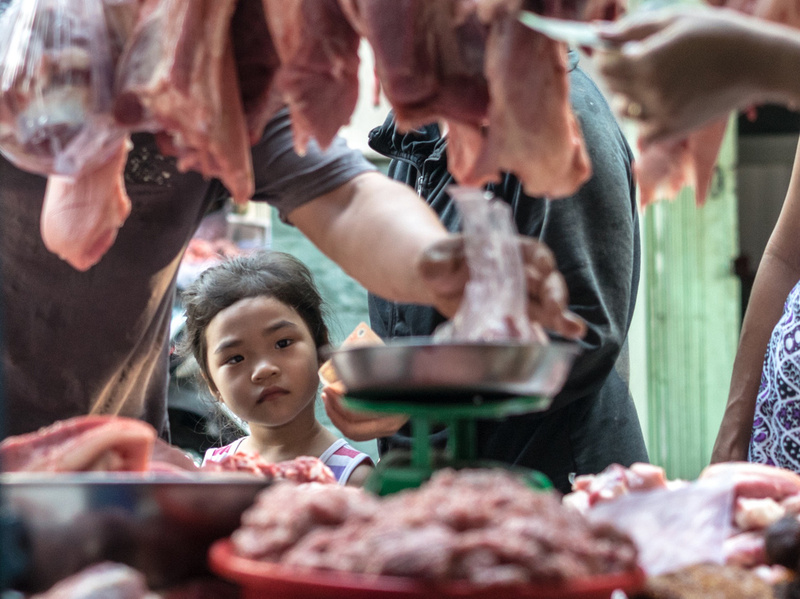 Among the ears, trotters and tails, the dangling slabs of meat, the female butchers add an gentleness to an otherwise harsh-looking environment. 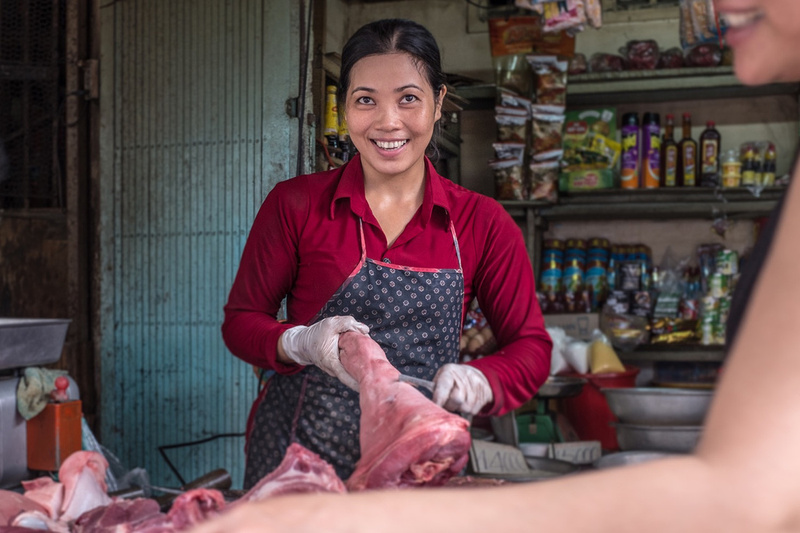 The colors, the contrast and the banter are part of what I love taking pictures of the female butchers at Saigon’s wet markets. And if you stop and show them the shot, you’ll often get a hearty reaction. They’re some of the loveliest people there. Tanya Olander is a Swedish-American photographer based in Ho Chi Minh City, Vietnam. She's the creator & photographer behind the popular "Somewhere in Saigon" Facebook and Instragram accounts. With a curious and empathetic eye, she focuses on creating visual stories. See more of her photography work at tanyaolander.com or learn about her project, Somewhere in Saigon. I’m Phuong from Sai Gon. I have followed your channel for a while. I am writing to express my appreciation for your great effort of taking lot of Saigon’s photographs, Thanks to your wonderful works, we could view Saigon through different angles and behind-the-scene stories. I am recently studying photography on my own and find your work as a motivation for me to keep learning. Hope you have a wonderful time here in Saigon!